For a Turk, a summer without fried eggplant is simply impossible, unheard-of. Along with other eggplant dishes such as stuffed eggplant "split belly" , or its vegetarian version, "imam fainted," or roasted eggplant salad, fried eggplant honors our tables at least once every week. However, if you live or spend your summers on the coast, which is not very uncommon since Turkey is surrounded by seas (Aegean, the Marnara, Mediterranean, and the Black Sea), your eggplant intake might be daily; there's something about coastal weather and eggplant. 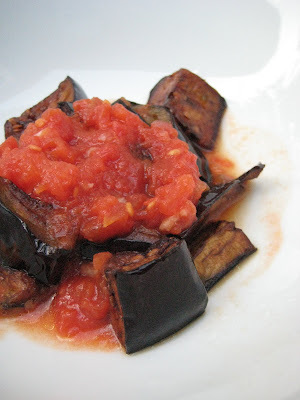 Fried eggplant is the easiest eggplant dish in Turkish cuisine. The simplicity should not deceive you; it is as delicious as any complicated eggplant dish. It's always served either by a tomato or a yogurt sauce. Both sauces should be loaded with garlic. Although this is a simple dish, there are a couple things to be careful about when cooking with eggplants. Buy eggplants right before you cook and pick the firmer ones. Eggplants tend to get soft in the refrigerator. Even though its skin is thick and sometimes bitter, do not peel it all the way; peel it lengthwise in 1/2 inch stripes. Once peeled eggplants darken fast. To prevent this you can take out the spongy middle part with seeds and keep eggplants in salty water until you cook them. -Keep diced eggplant in a salty water until ready to fry them. Drain the water, squeeze eggplant, and pet them dry in a clean kitchen towel. -Heat oil in a pot. When it's really hot put eggplant in and fry in portions. -Put a paper towel at the bottom of a plate. Take out eggplant with a slotted spoon and put over the paper towel. -For the tomato sauce, put grated tomato, minced garlic, and salt in a pot and cook for ~20 minutes until tomato is cooked. 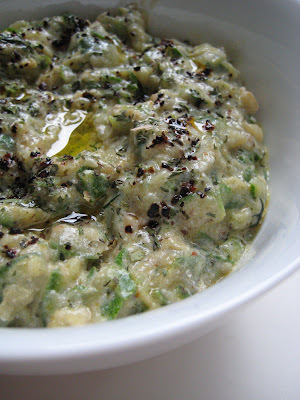 -For the garlicy yogurt sauce, beat minced garlic with yogurt. -You can either pour the sauce on fried eggplant on the serving plate or on your plate, the choice is yours. But do not have it without sauce. What brings the beauty of this dish is definitely the garlic. Sounds delicious, and yes, I would like to have plenty of garlic! what a good cooking tip! I have an eggplant (but 2 days in fridge already... hope it not getting too soft), ready to make your fried eggplant for lunch, really look too good! Kalyn-When it's eggplant we're talking about, I'm with you: plenty of garlic. Gattina-I'm sure it's still fine. Bake one of your olive breads, take the corner and stuff fried eggplant with sauce in it. I love your blog recipes! I am living in the Middle East this year and find many of the ingredients and recipes to be similar. I made your Eggplant grilled (healthier, I thought...) but kept all else the same. Delicious. Keep on posting! Loving eggplant as I do, I'm so glad I found you through WHB. Thanks for sharing some great eggplant dishes. I'll be back often. Debra-grilled is definitely lighter than fried, but what can I do? Fried eggplant is so tempting! Hi Ruth, it's always nice to see that others love eggplant, too. I posted a number of eggplant dishes last summer and I have more to post this summer. Tomatoes kill the flavour of the aubergines. I love tomatoes, but give me plain aubergine and pepppers anytime, with stupid amounts of salt, of course.